Alright, here you have it. This photo right here…this is the reason I bought a set of close-up filters. Every time I have seen a shot like this over the past several years I have wanted to get one of my own, but never had the proper equipment to make it happen. Certainly any one of my cameras could get this shot, even my old D200, but there’s no way to get a picture like this without using some type of macro equipment. The subject is just too small, and taking a picture with a normal lens and cropping it in post does not at all yield the same results as simply getting very close to the subject. However after getting my close-up filters and trying a few experiments I knew a shot like this was possible, which then meant I had to find a way to make it actually happen. 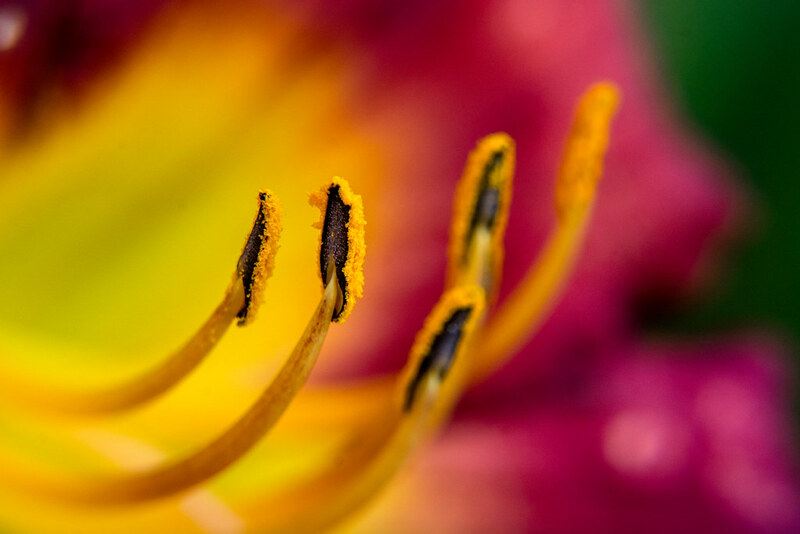 What you are seeing here are the anthers at the end of the filaments on a flower. (It’s some kind of lily, I think, though I’m not certain.) I found this, as I do so many of my Weekly Fifty pictures, on the campus of Oklahoma State University as I was out running an errand one day in late May. I figured we must have had some flowers on campus that would allow for this type of image but for a few weeks I had been mostly unsuccessful in locating any, until I cam across this one near the south side of our student union. There was a bit of a breeze so it made focusing a little tricky, and I ended up mostly just moving myself forward and backward as I snapped the shutter in order to get the picture I was hoping for. Even at f/8 I knew the depth of field would be so shallow as to be almost uncontrollable, and autofocus wasn’t helping much because of the way close-up filters degrade its accuracy along with the light wind causing its own set of problems. I kept at it though, and after shooting the flower from one side I scooted over and tried a different angle while finally resulted in the image you see here. I hope I’m not being conceited when I say how pleased I am with the picture and the way it turned out–it’s not often that an image comes across exactly how I picture it in my mind, but that’s precisely what happened in this particular instance. I like the clear, distinct color palette and the sharpness of the foremost anther, and I like how you can clearly see a context for the subject too. Going much wider on the aperture would have resulted in a depth of field that would have likely obscured too many background elements and made it well-nigh impossible to get the one single anther in focus anyway. Good morning! Looking at your macro photo was a pleasant way to start the day. I know very little about macro photography. But, I do know what I like and find the photo to be rather compelling. Let me say, ‘if that is the depth of field at f8, then f1.4 or f1.2 would have to be razor thin’! Is a tripod helpful with this type of photography? You mention the use of “filters” to get the macro effect. Can you give some additional information on type and qualities that make a good filter? Glad to be back enjoying your work. Have a blessed day! You’re right about the depth of field, David! When shooting ultra close up pictures you almost have to use small apertures because the depth of field is so crazy shallow. Shooting at f/1.4 or f/1.4 would be like one or two millimeters in focus when you are right next to the subject! I have an inexpensive set of macro filters. They are fun to play with. Great photo! Thank you Simon to continue your worK on closup filters which you have wrotten in past . You have gotten excellent results w/o the use of a tripod and or macro focusing rail. Thank you Narendra. I am really enjoying these filters and I think I would like to try it more with a tripod. When shooting such close distances it’s really difficult to get the focus right, since the depth of field is so shallow even at smaller apertures. A true macro lens would be awesome though! Congratulations! I always pick my own macro apart on grounds of landing that limited DOF and also using negative space while still finding that angle that puts the right features on display. You’re very good at getting a very intentional feel from limited DOF which is essential with this macro stuff. Nice composition and great colors. Watching these photos makes me want to try it myself. As I can see you are using filters that fit the 50 mm lens. Have you tried this kind of photography with other lenses? What if you have used o bigger thread let say 77 filter and then used step down rings. Will that produce different results? I have lenses that take 58, and 77 filters and this is where this question is generated. Thanks for providing this great work.